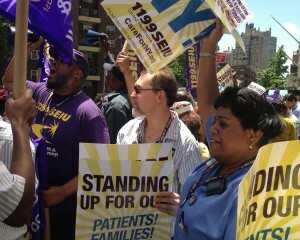 With about a month left before their labor contract expires, thousands of 1199 SEIU healthcare workers rallied outside hospitals across the city Wednesday. Members want to see their free health coverage continue under any new contract. It’s been a major sticking point in negotiations and union representatives said they have already sacrificed enough.